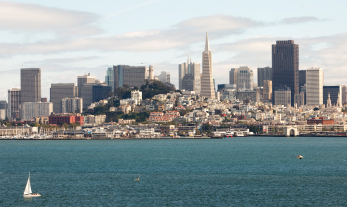 For a list of attorneys in the San Francisco office, click here. Two Embarcadero is on Sacramento Street, between Davis and Front Streets. After you exit the fare gate, bear to the right to the exit that is marked "Market and Pine St. Exit A3" and go up the escalator. You will come out on Market Street in front of 388 Market. Walk ahead to first intersection, Front Street, and turn right. Walk two blocks to Sacramento Street; cross Sacramento. Two Embarcadero Center is to your immediate right. Go to the escalators at the center of the building. Go up one level to the Lobby Level. The entrance to the Two Embarcadero Center office building will be behind you. Our office is on the 5th Floor.